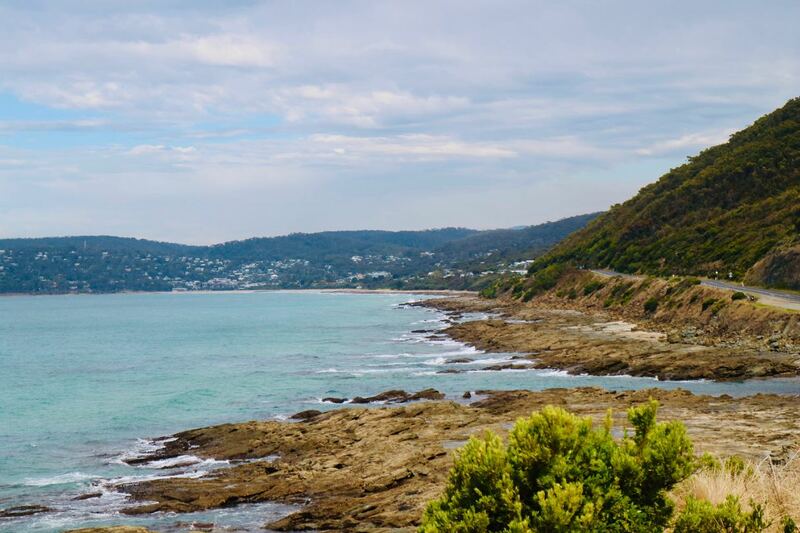 Lorne is a sentimental favourite seaside town of mine. We went there a lot when I was young. 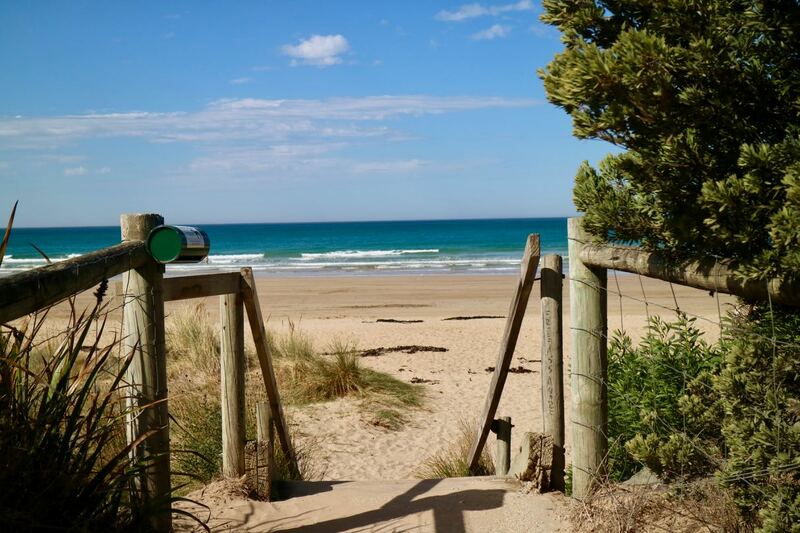 So I am probably biased when I say it is one of the best beaches in the world. It was a surprise when I suggested to Sylvia we had a quick overnight break there and she said she did not remember going there. Seems our trips there when she was much smaller had no impact! We drove along the Great Ocean Road which always sparks joy. It is so beautiful. And I appreciate it even more because I think of the returned soldiers and unemployed men who carved the road into the side of the cliffs so we can enjoy superb views on the way to Lorne. Our first stop upon arriving at Lorne was Louttit Bay Bakery. 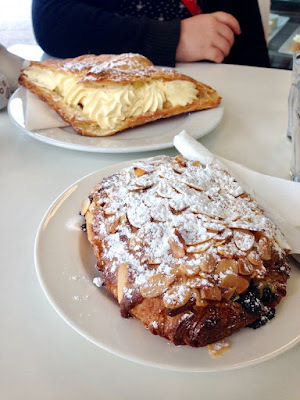 Sylvia had an apple turnover full of cream. She was so happy that it was all the things she loved in life: pastry, cream and apple. I had a chocolate almond croissant. I was so happy because it was all the things I love in life: bread, chocolate and nuts. Both were huge and so so filling. Then we went to the Swing Bridge. I loved going to the Swing Bridge as a kid. 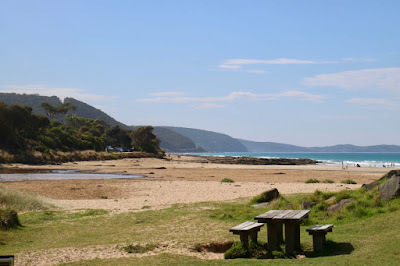 We used to sometimes swim at the mouth of the Erskine River just near by. Actually part of the reason I went there was that parking in the main street was really busy. But I also wanted to go there. The bridge was replaced in 2013 and is not quite as wobbly as I remember. We had lunch by the bridge (cafe post up soon), had a lovely time in the sea and then headed to our hotel (that Grand Pacific which I will write about). 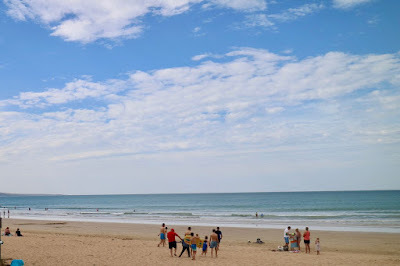 For old times sake, we went back to Lorne Fish and Chips where we went on a previous visit. We took our chips, corn jacks and potato cakes down to the beach. 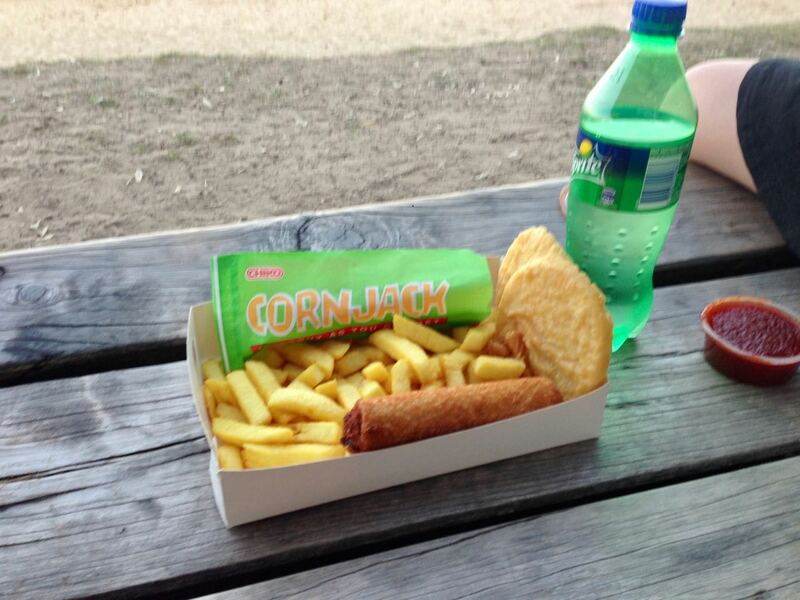 It was stodgy but piping hot, crisp and great comfort. 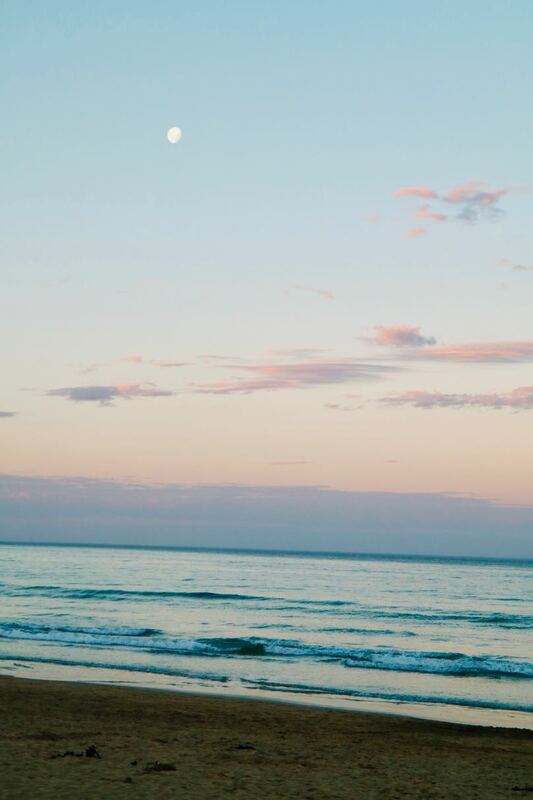 We went there early enough to enjoy watching the beach in the twilight. 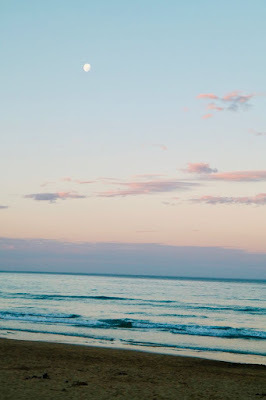 Visiting the beach in April means that there are no long light evenings. At this time of year we were lucky to have a balmy evening but the sea seemed freezing cold if the way people dipped in and out. In fact the next morning after breakfast the sea was still so cold that our feet felt like ice blocks. 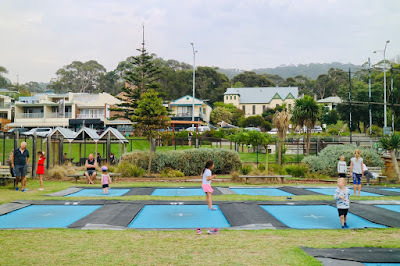 Lorne is great for kids with so much to play on near the beach in the huge grassy area. 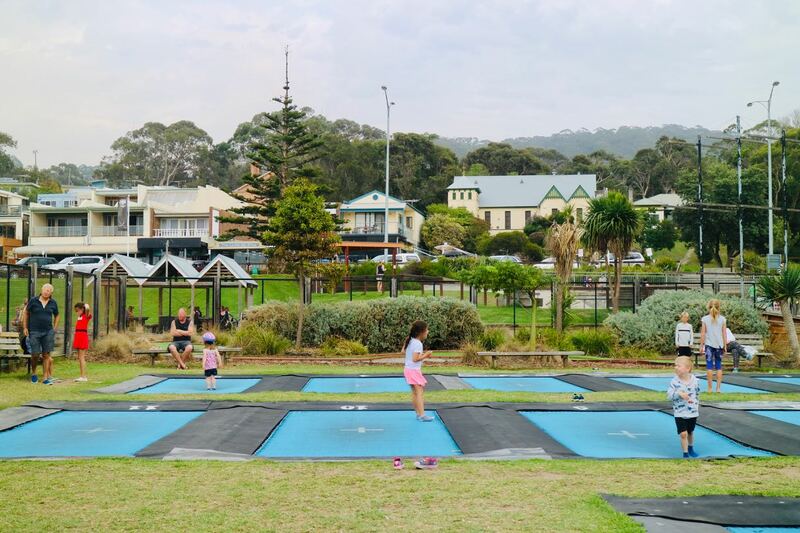 Sylvia had a 10 minute session on the outdoor trampolines (for $7 which seemed a bit pricey compared to city trampolining centres but someone suggested this was the way to make it viable). And she had lots of fun. Then we went to the park, which is huge and impressive. 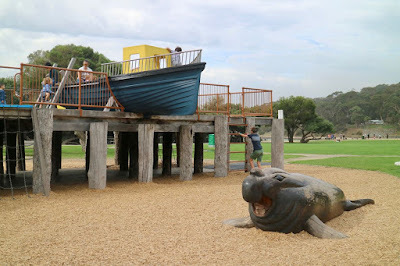 When we told my sister that we went for fish and chips (or at least to the fish and chips shop if not for fish), she said she hoped we went to the Salty Dog. So we had to check it out when we walked along the main street. 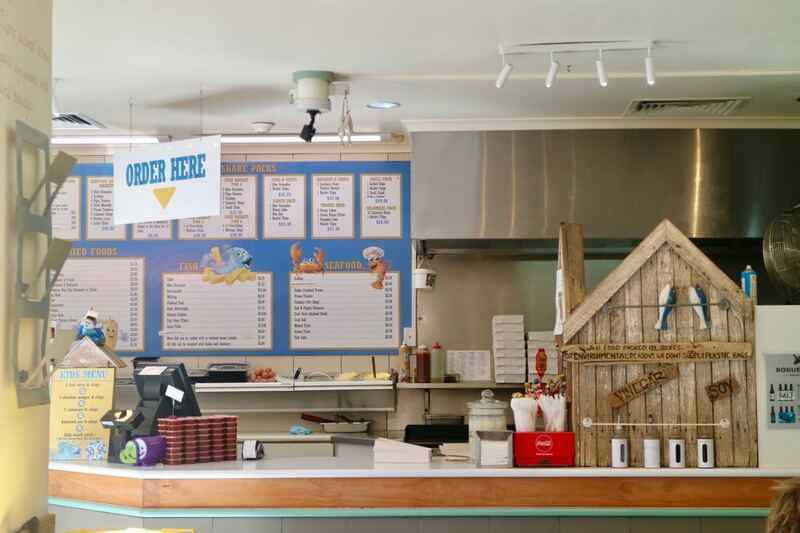 Whereas the Lorne Fish and Chips was pretty old school with off white walls and old style booths. Salty Dog has more colour and zing about it., Salty Dog is far more modern and cheerful. It has a large menu, including deep fried mars bars and fried pumpkin cakes. There are cute picture around the place, wooden benches and key dates in Lorne's history written on the walls. The Salty Dog Fish and Chippery had baked potatoes. We decided that sounded great for lunch. Sylvia had the baked potato with garlic butter and cheese. I had the baked potato with the garlic butter, cheese, sour cream and coleslaw. I added baked beans too. The baked potato was good. 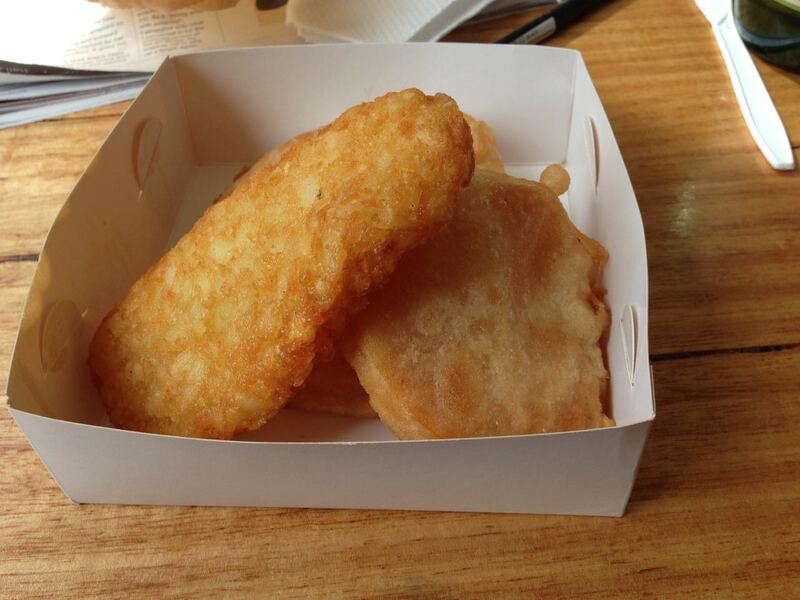 It was a bit weird that the cheese was melted over the whole lot and I would have liked the potato skin more crispy. However it was a pretty decent lunch. What I can rave about is the pumpkin cake. That means a slice of pumpkin dipped in batter and fried. It was so good I must come back for some chips and corn jack some time soon. Sylvia loved her hash brown too. Sadly we were too full for deep fried mars bars. Even though we were too full for deep fried mars bars, Sylvia still needed an ice cream at the place next door. She had a really good english toffee ice cream and some so-so mini melts. We had been discussing mini melts recently and had to sample them. A spoonful was enough. Not surprisingly, neither of us could eat much of either. We also had ice creams the previous day, and it was not terribly successful either. Butterscotch and brownie sounded good but big chunks of brownie in the ice cream did not work for me. And Sylvia hardly touched hers. The main street of Lorne has a lot of places to eat. Kaos Kafe, where we ate years ago, is still there. So is the Bottle of Milk. We wanted to try the Chopstix Noodle Bar. But there just wasn't the time. I loved the above sign even though I don't drink either coffee or wine. 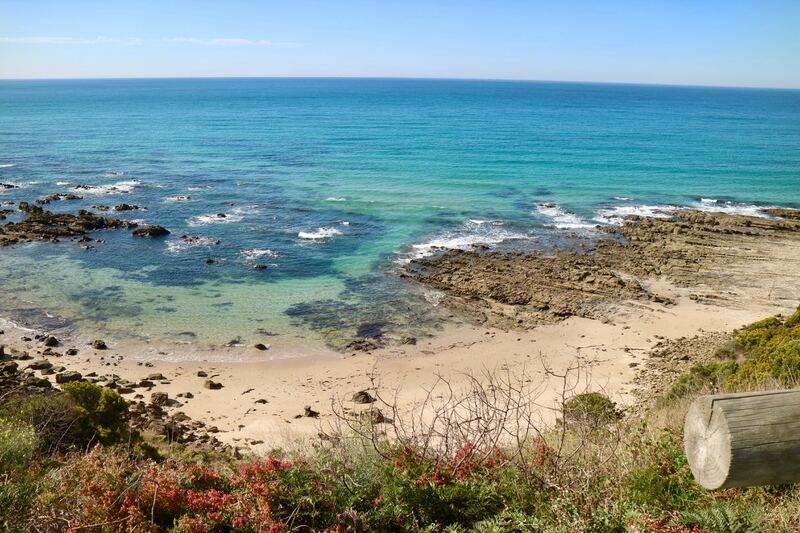 We had a last paddle in the waves, climbed over some rocks and drove home along the Great Ocean Road, stopped at my parents in Geelong and then were very happy to be home. But it was great to be at the beach. It is good for the soul. If the fates were kind this week, they might have offered a warm autumn night last night for rising hot cross bun dough. I can't complain though, as we managed to spend a couple of days at the beach over the past week. But warm weather does make a difference to sourdough rising. And today being Good Friday, my sourdough starter has been doing amazing things with hot cross buns. Given that I made overnight sourdough bread often, I am surprised it has taken me until this year to make overnight no knead sourdough hot cross buns. Now there is no turning back. This post is quite a long one with lots of comments about what I did to help me (and you) to make these buns. 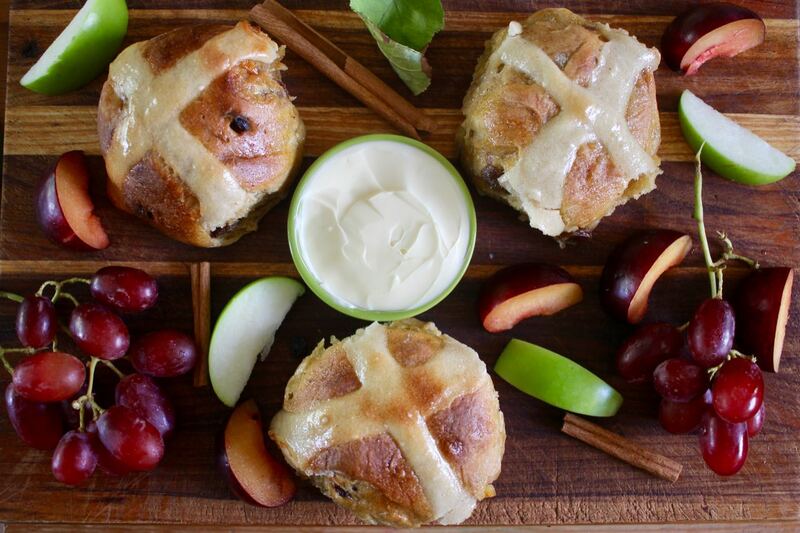 This Easter season is particularly conducive to baking hot cross buns because it is so late this year. I have been baking hot cross buns every year for a long time. 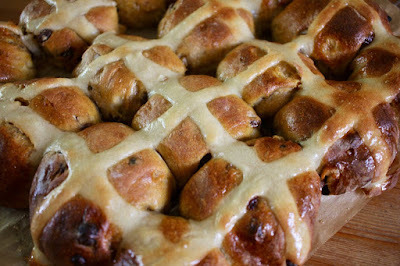 However, I usually find that by Good Friday I am just starting to hit my stride with hot cross buns. 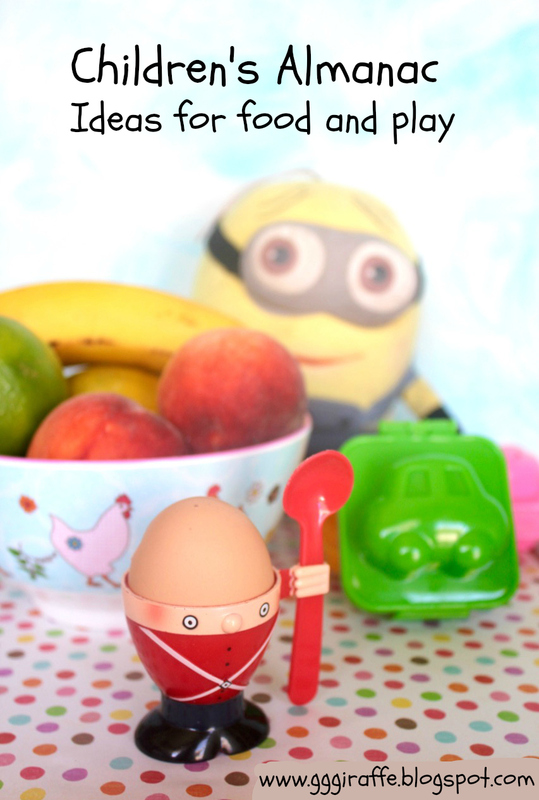 This year we have had the school holidays before rather than after Easter. 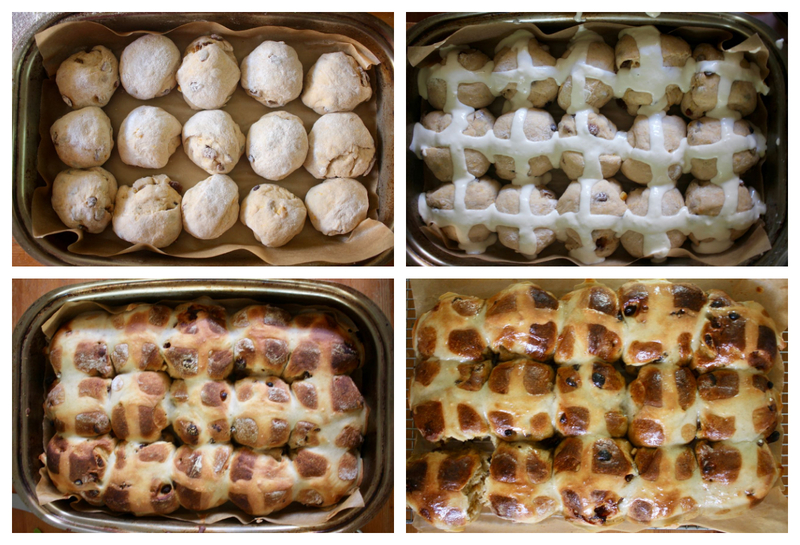 So I have had some time to bake a few batches before Easter. The first batch we tried had green crosses and were filled with grated apple, chopped hard toffee and grated apple. The green crosses were fun but I realised I preferred the white crosses. It was a shame as I had visions of dried blueberries with blue crosses. I was very happy with the hot cross buns. We took some to a friend when we picked up her daughter for a sleepover with Sylvia. She was rather impressed. However I wanted more traditional ones. Sylvia is fixated on the dried apple and cinnamon buns from Bakers Delight. I didn't want to buy dried apple while I still had so much dried fruit left from Christmas baking. We made a deal that she could buy some apple buns while I made more traditional ones. This second batch of dough was slightly less sticky but still very soft. I found an old scraper in the drawers that has been great for cutting dough. I think I have benefited from regularly baking bread rolls with the overnight sourdough dough. Doing no knead bread means treating it very gently to keep as much air in as possible. I have tried to give some instructions as well as step by step pictures below. This second batch were amazing. Soft and flavoursome and so so so so good. I did as my mum had suggested and increased the spices. My main problem with them was that the roasting dish makes them a little mishapen around the edges. Rustic is ok with me but I want them approximating round rather than triangular. Otherwise I was very proud of my buns. They were adapted from a previous sourdough hot cross bun recipe I made a couple of years ago. 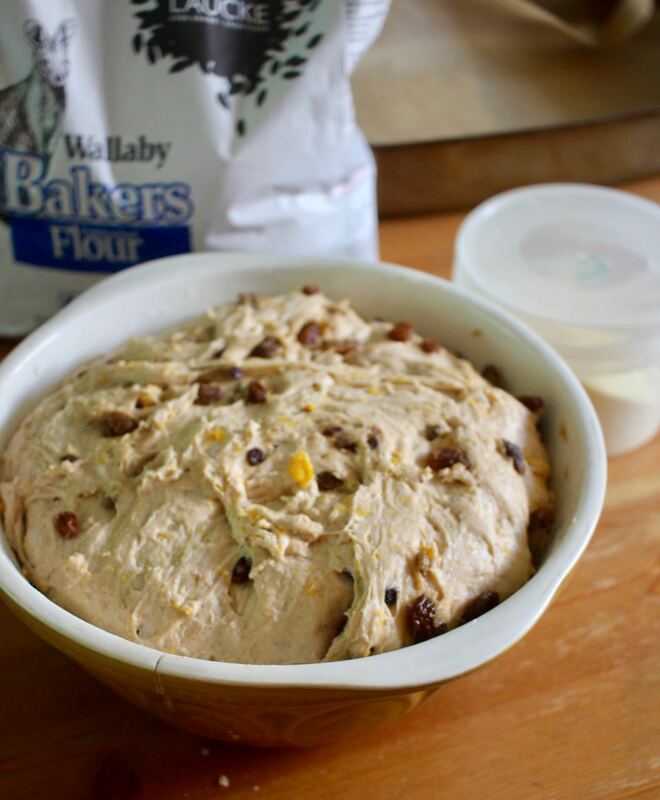 It seems I have been gradually simplifying my sourdough hot cross buns recipe until I just dump all the ingredients in and leave it overnight with no kneading. Honestly I think I was perhaps too tired this year to knead with life being so busy. 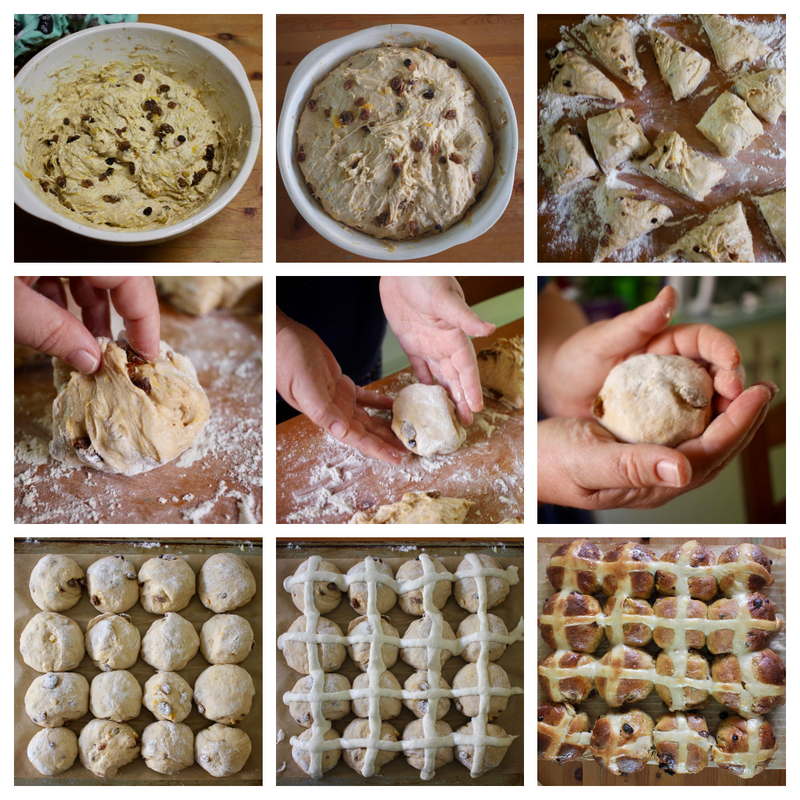 I also was inspired by seeing Karen's no knead sourdough hot cross buns at Lavender and Lovage. One of the changes I made was adding pumpkin. It did not make much difference to the taste but I think it made the buns much softer. I have made some suggestions in notes about other options if you don't have pumpkin. As I just mashed mine with a knife, there were a few small pieces of pumpkin visible. Sylvia hates pumpkin and was most displeased. Of course, if anyone was going to find a tiny speck of pumpkin it was her. Despite this she has managed to eat a few buns, mostly picking out the dried fruit. I have also reduced the amount of glaze I was making. 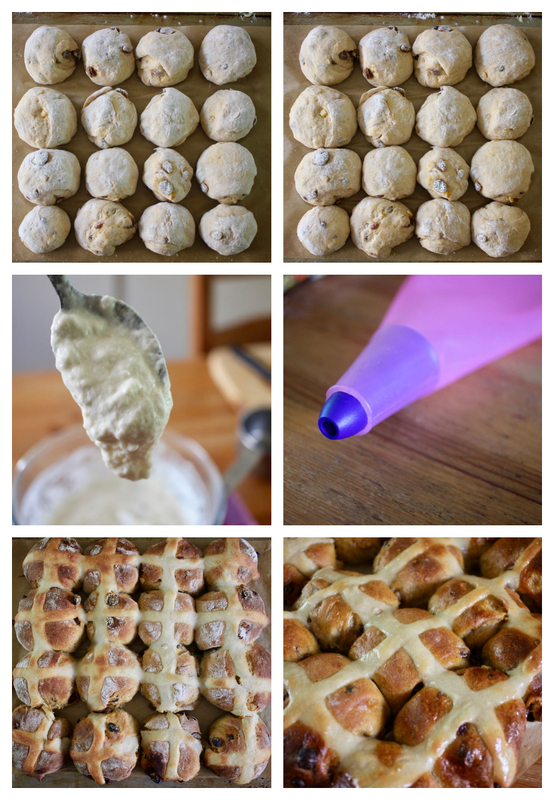 I used to make a lot in a saucepan and brush the crosses over and over, based on a recipe I found years ago. This year I reduce the glaze and then I burnt it in the saucepan. I have never done this before. So I made more quickly in the microwave which I find much easier. My mum says this is what she does too. 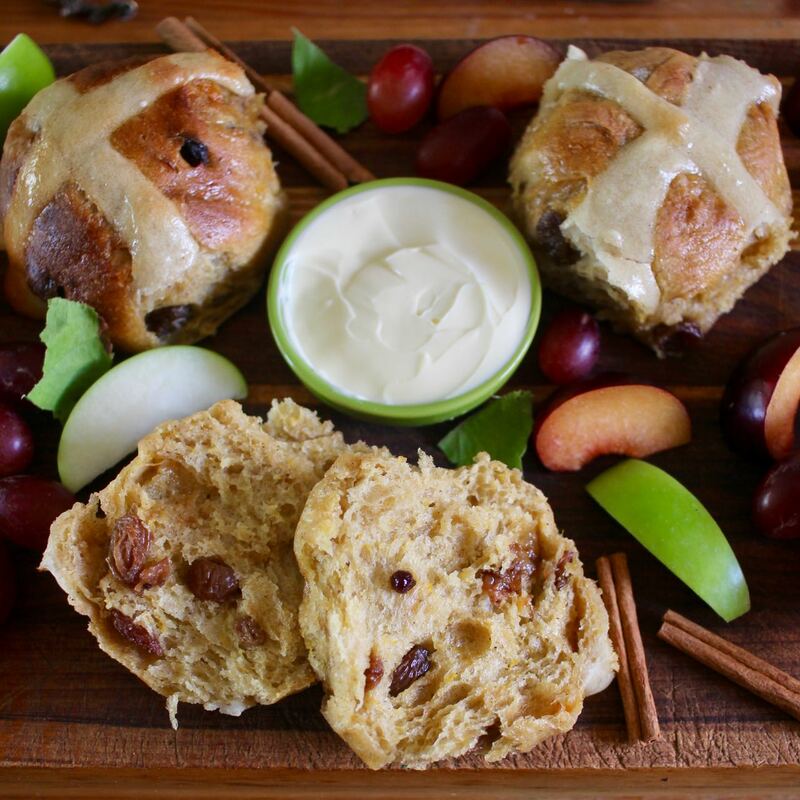 We gave some hot cross buns to my neighbour and some to my mum and dad when we went to Geelong prior to a couple of days in Lorne. I will tell you more about Lorne is some coming posts. 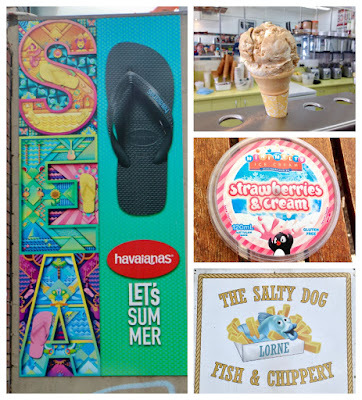 It was great to get some relaxing days at the seaside. I came back for a busy day of work before Good Friday. Today I made more hot cross buns. It is a treat to have already made a few batches and know what I am doing. And it is so wonderful to eat hot cross buns warm out of the oven with butter melting into them. So with more time today I have taken some step by step photos to help me next year and to also explain to you if you have a sourdough starter and want to try this recipe. I have also made some notes about how to make variations to suit what you have about your kitchen. You might notice that I made this third batch of buns on a large baking tray so they had a better shape and I could make 16 rather than 15. The main problem I had with this was the when I went to turn the tray around halfway through baking, the last row of buns stuck to the back of the oven tray so I had to prise them off and get them back on the tray before turning. I have also included the above collage to show a few things. 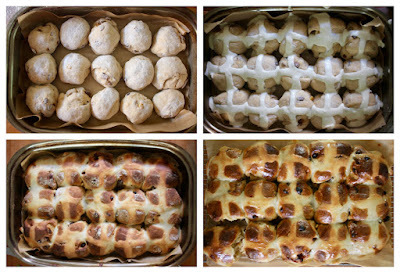 The top two photos show that the buns don't rise much from when I shape them to when they have sat for about 2 hours. The main rise where they get lots of air in them is overnight (as you can see in the step by step collage higher up). But it does seem to help them to sit before going in the oven. The middle photos are to show that my cross mixture is quite thick and not so smooth. I use a silicone piping bag and a tip that is perhaps 0.5cm wide. My crosses are pretty plain but work well between the bun and the glaze. I suspect they are what one of the journalists in the age called wallpaper paste crosses. But we love them a little thick and fight over the crosses. 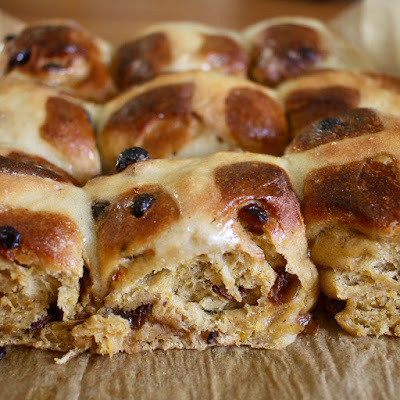 In fact I have found one or two buns with the cross eaten off it by Sylvia because it is the best bit. And the bottom two photos show that when the buns come out of the oven they can look a little dusty with flour but once they are brushed the flour dissolves and is no longer visible. 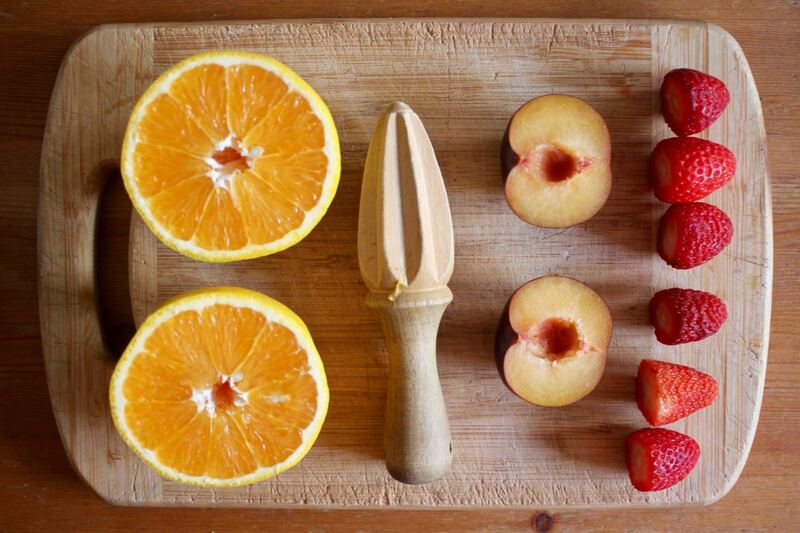 So today I cut up some fruit to have with our hot cross buns. I like that the pumpkin and the fruit reflect us celebrating Easter in autumn down under. The fruit came from a few different sources. The plums were from the supermarket. The grapes were leftover from a cheese platter at an evening meeting last night. The apples came from my mum's backyard tree. The fruit makes me feel a little healthier but honestly I could just eat these hot cross buns all day and not need any other food. They are so good. We have all heard of hot cross buns in bread and butter pudding and french toast but who ever heard of it in treacle tart or with beetroot and feta. Wow! 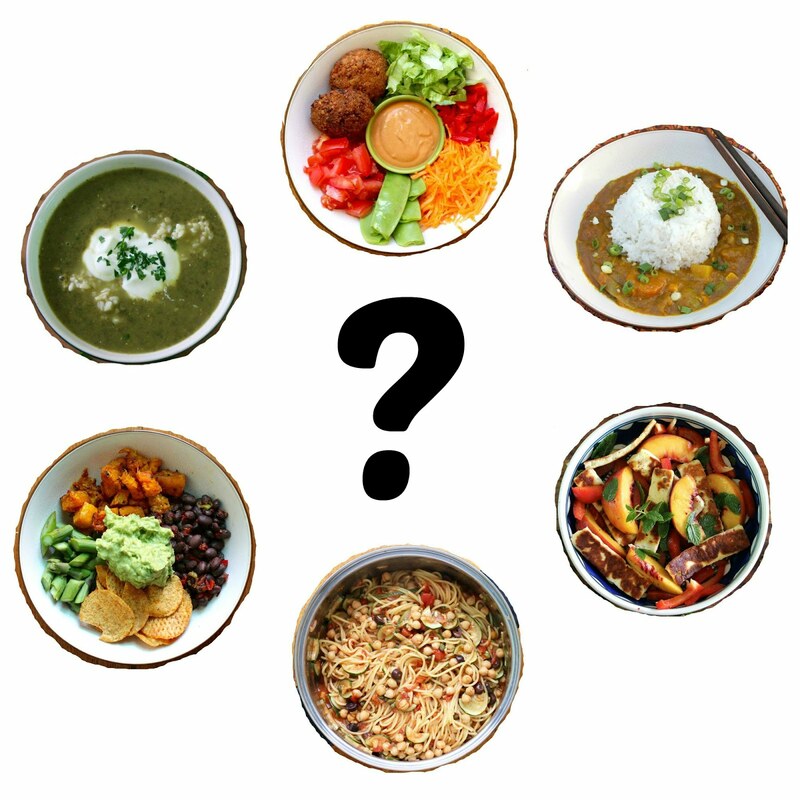 A comprehensive article on different styles of eating HCBs. 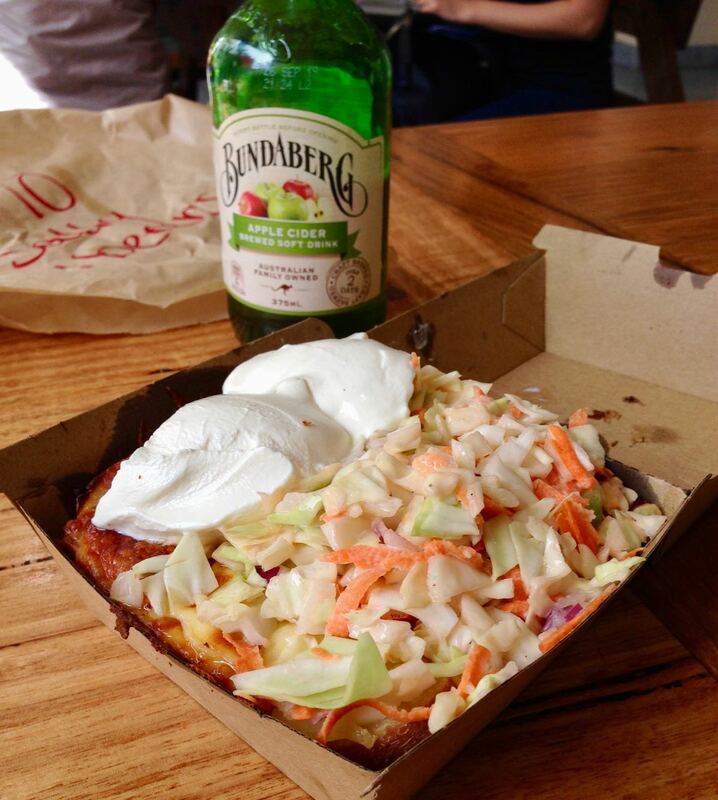 I say no to marmite (or vegemite in Australia's case) but yes to a slice on cheese on the HCB. I am surprised that they only give toasting or microwaving as reheating options. Since I have been little I have had HCBs reaheated in the oven. Clever union slogan on the napkins served with hot cross buns: "Liberal wage cuts make us hot and bothered". 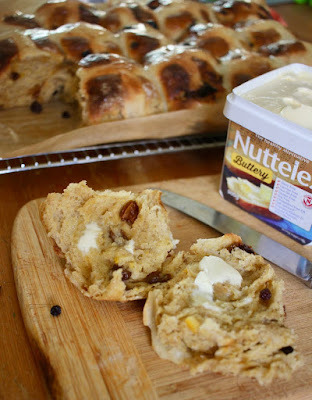 Yes there is a federal election campaign in Australia right now and even hot cross buns are fair game! Don't worry the police say there is little concern that hot cross buns will give you a drink driving conviction but this also means they wont take "I've just eaten a hot cross bun" as an excuse for a high blood alcohol test reading! 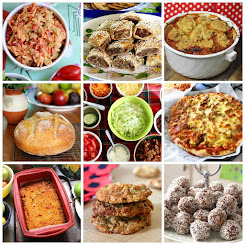 You can also read more of my Easter recipes. While the pumpkin cooks, measure out the starter (mine is best when it is rising and had lots of little bubbles and smells lovely and is still a bit thick in texture) and stir in the margarine. Add remaining ingredients and stir well. Leave for 30 minutes. Knead in the bowl for 15 seconds. It will be very soft still but you should be able to knead it and wipe most of the mixture off your hands. Cover well with clingwrap or beeswax and leave overnight - about 8-10 hours until well risen. When dough is risen, scrape out onto a well floured surface. Cut into 15-16 pieces (depending on the size of your tin - 15 in a rectangle and 16 in a square tin). I use a plastic cutter but a large sharp knife will do - and might need some flouring. The dough will probably need some flour to make it easier o handle it. Gently roll each piece into a ball. Do this by putting the corners as tightly as possible around the bun (without squishing the bun) so the floured bottom of the bun is like a little blanket around the bun. Toss in flour as though it is very fragile just using finger tips so it is not sticky. Then use your hands to shape into a smooth ball. Line a large dish with baking paper (or grease) and arrange balls in it quite close to each other so they are just touching but not really snug against each other. You can do this on a baking tray or in a roasting dish (about 13 x 9 inches). 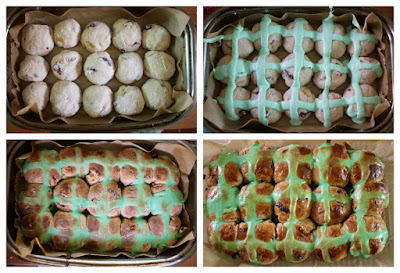 Cover buns with beeswax or clingfilm and leave to rise for 30 to 2 hours. Heat oven to 220 C while buns rise (or 30 minutes before you are ready to put in the oven). Mix flour and water together to make the mixture for the crosses once buns ready for oven. It should be thick enough to be almost stretchy and drop off the spoon in soft clumps. Pipe crosses onto the buns. Bake for 25-35 minutes or until golden brown and sounding hollow when tapped. Five minutes before buns come out of oven or just as they come out, mix glaze ingredients together and microwave for about 1.30 minutes on high. Remove buns from oven. Transfer to a wire rack. I have found it this easier if the baking paper has some overhang so you can use it to pick the buns up (even easier with another person who can pick up the other two corners to help you lift it). Brush buns with prepared glaze and see if you can wait for them to cool before you sample one. 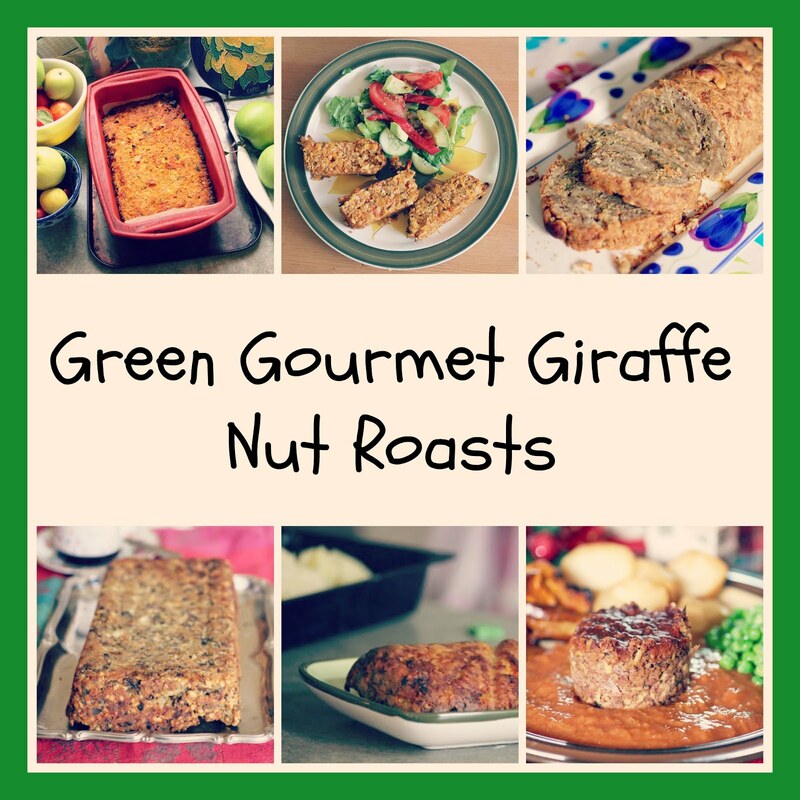 They are good for 2 to 3 days or can be frozen. I reheat my buns from room temperature for 10-12 minutes at 180 C.
This is not a quick recipe to put together. It has taken me about 30 minutes to get the pumpkin cooked and organise all the ingredients for the dough. Additionally there is shaping the dough, doing the crosses and glazing. You could substitute all sorts of things for the pumpkin: tinned pumpkin puree, mashed potato, fruit puree, grated apple, mashed banana, applesauce, fruit mince etc. It should be something to keep the dough moist. If you don't have aquafaba (water drained off a tin of chickpeas) then use more milk or some water. These buns are vegan but you could easily use an egg instead of 1/4 cup of aquafaba and make up the difference in milk and use butter instead of margarine. You could use your own spice preference - nutmeg, cloves or cardamon could all be in here, though not too much of any. If you don't have mixed spice, pumpkin pie spice or your favourite spice mix could be substituted. Use your own preference for dried fruit: apricot, apples, cranberries, figs etc. 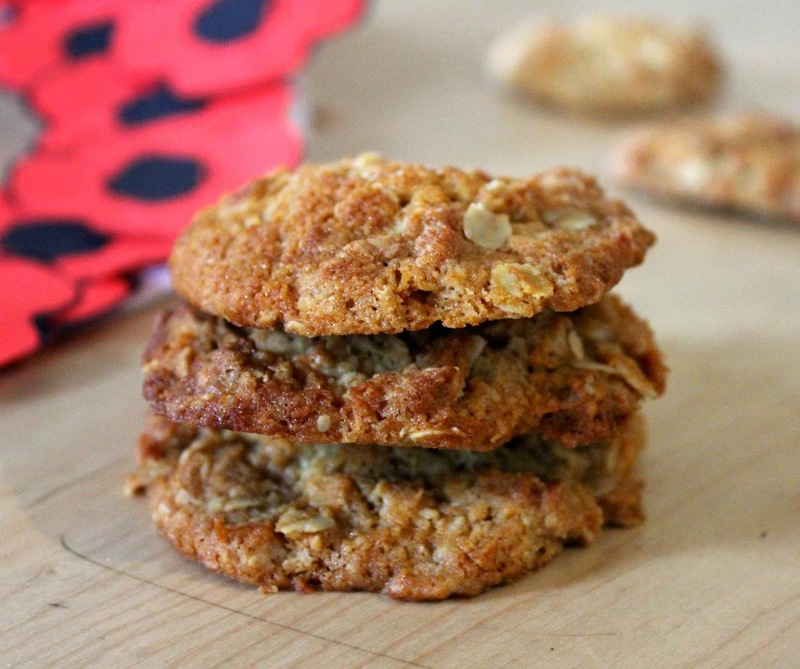 Or use choc chips or jersey caramels if that is your thing! The dough is really sticky and it seems it might be too sticky but it does become more cohesive after the overnight rise. And it is the high ratio of liquid to flour that makes these so soft. 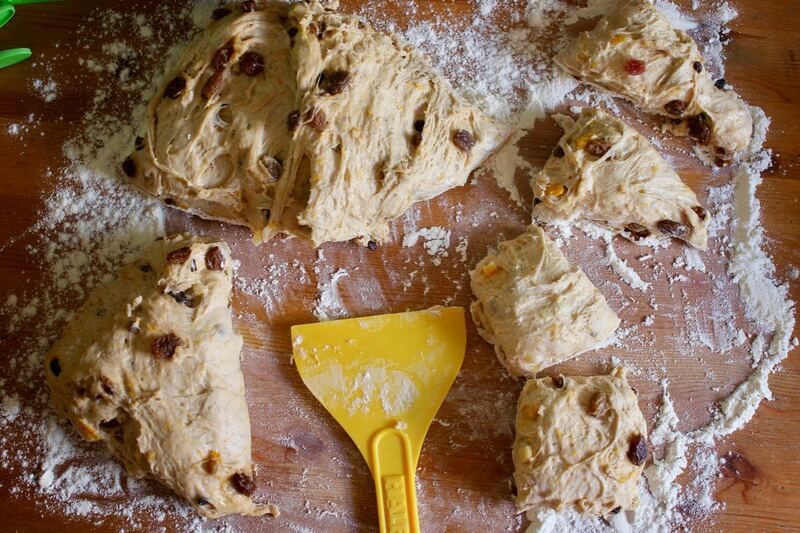 If the dough is too sticky, use a bit of flour to handle it. This recipe can be quite flexible with timing and the rising dough and rising buns can wait til you are ready. Don't worry if the cross mixture seems a little lumpy. as long as you give it a good stir it should be fine. Don't worry if the buns seem a little floury when they go in the oven and when they come out. Once brushed with glaze the flouriness will go. The glaze should be just enough to brush all the buns once. This recipes does not feel terribly original. It is the sort of thing I have made many times before and no doubt many readers have too. Though it is a long way from when I first moved out of home and decided I could make curry with no recipe and ended up with a curry that clumped around the wooden spoon when I picked it up. 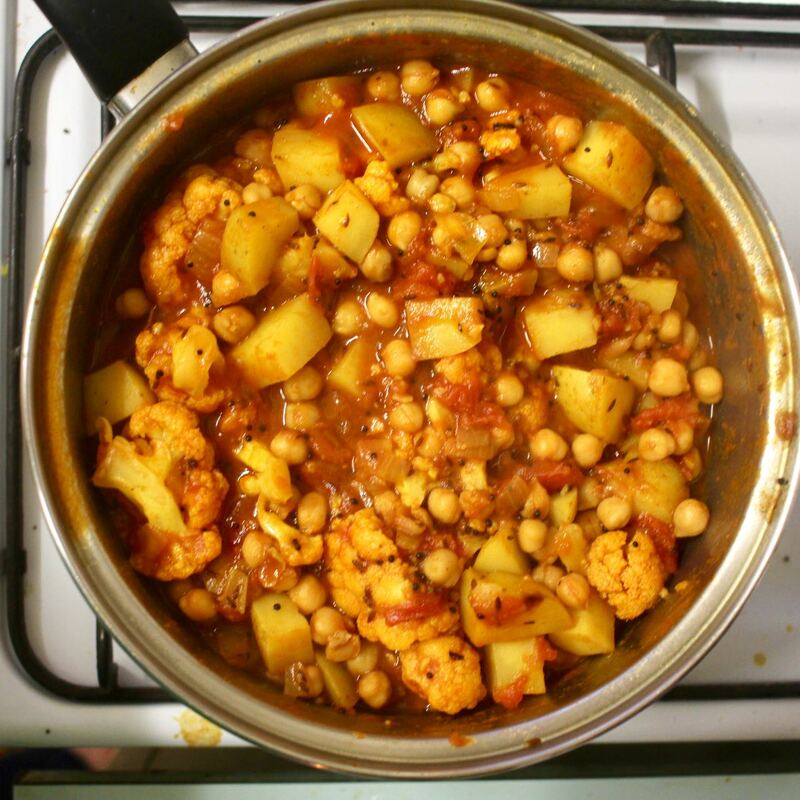 This curry is one I made to please my 10 year old daughter. It is always special when she eats a dish that is not a usual one for her. So I was happy that, while it was not perfect, it was good enough for her to eat. 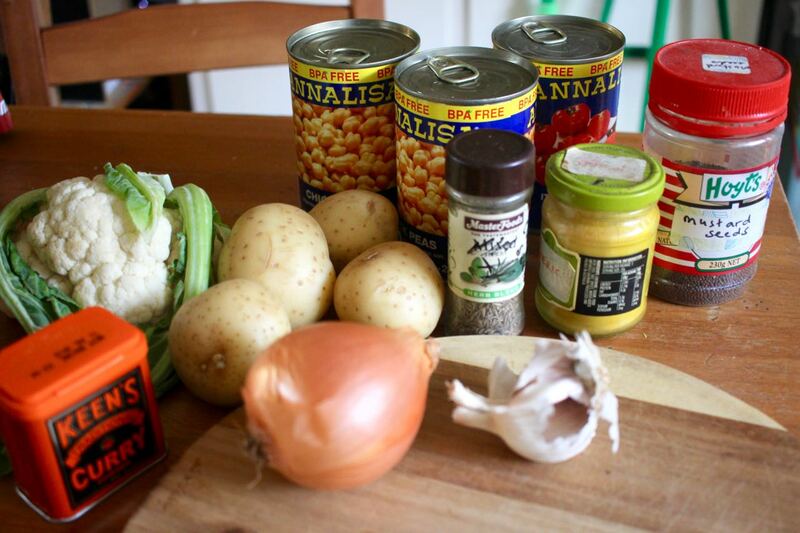 The recipe began with the Chickpea and Cauliflower Curry we found in the Woolworths Fresh magazine. My first instinct was to look in the fridge and find all the vegies that needed using up. Then I discussed it with Sylvia. She loves chickpeas. 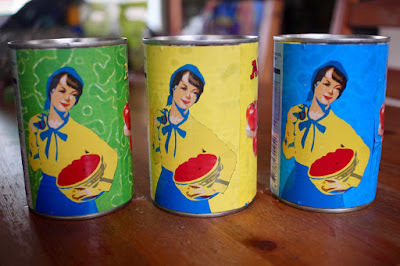 In fact, it is not unusual for her to open a tin of them and eat them cold. I decided to add potato which is another of her favourite foods. I left in the cauliflower. But the most controversial vegetable was onion. She is not a fan, despite my reasoning that it is sweet and everywhere. I had overlooked the seeds. I love a curry that starts with seeds. Sylvia does not like seeds. They did not go down well. She asked what were the seeds looking at her like eyeballs. But she ate it two nights running, with only a few complaints. As for E and I, we were very happy with the curry. I would have liked some peas or sultanas. It was the sort of golden curry I grew up on and have made many times before. It was easy to make and easy to eat. I might try it for Sylvia another time with some dried cumin and mustard but I am very partial to some seeds so I would happily have it this way again. Heat oil over medium heat and fry mustard seeds and cumin seeds for about 2 minutes or until they start popping. Stir turmeric and curry powder in for a minute. Add onion and garlic. Cook for about 4 minutes and add potato, stirring frequently for another 2 minutes. 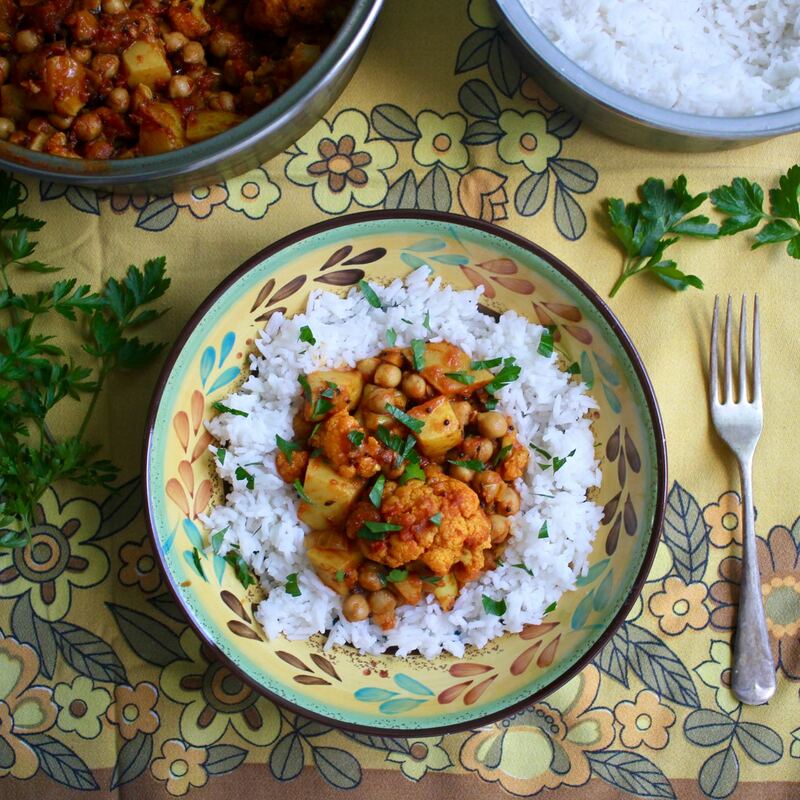 Stir in cauliflower to coat with spices. Then add tomatoes, water, stock powder, tomato paste and chickpeas. Bring to the boil and simmer covered for 15-20 minutes until potatoes are soft. Serve with rice and chopped parsley or coriander if desired. 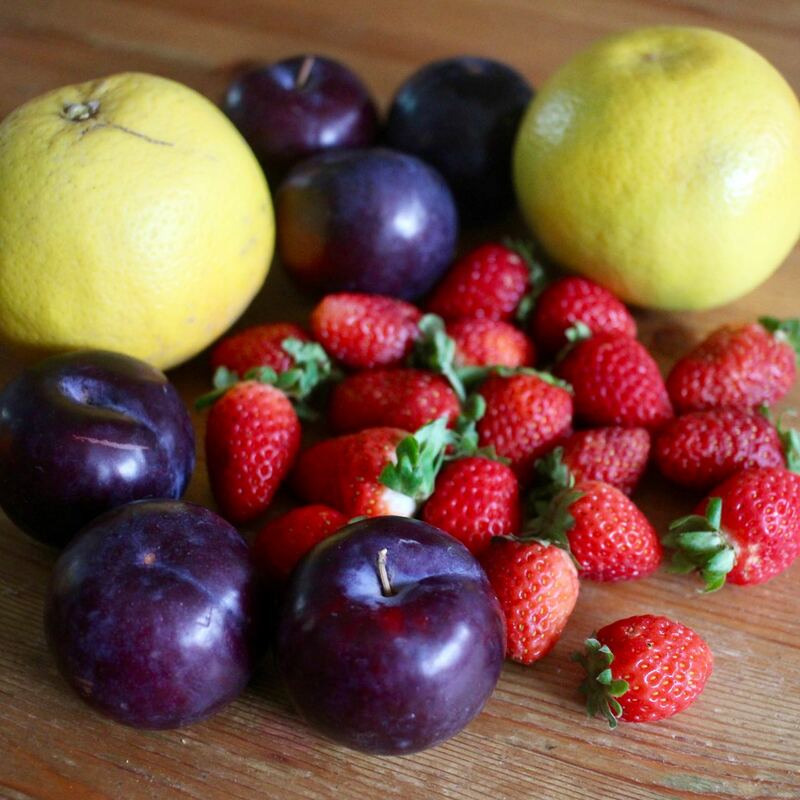 As I sadly farewell the summer fruits, I have to remind myself of the bounty of autumn. It has been really busy at work which means less energy for eating well. 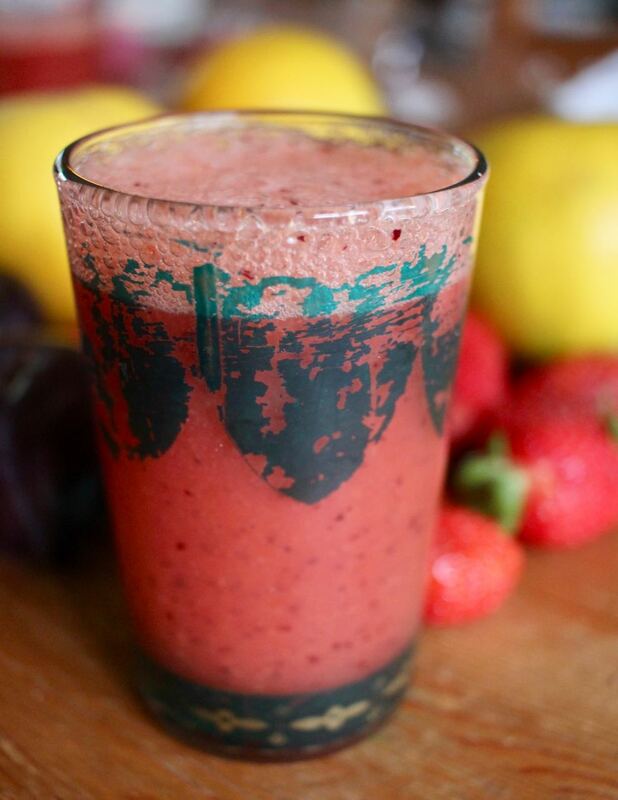 This juice has been the mainstay of our breakfasts lately. It it an easy start to the day and an easy way to get more fruit into our diet. I am relieved to finally be in the midst of holidays. It is wonderful to have lots of time to catch up with friends and family, to clean and bake, to head out to the shops and cinema (we enjoyed Wonder Park). Yet there is much to do. The days go quickly and I am still grateful for the juice. Rather than waking early and rushing to get out of the house, we are rising later and being a little slower to start the day. 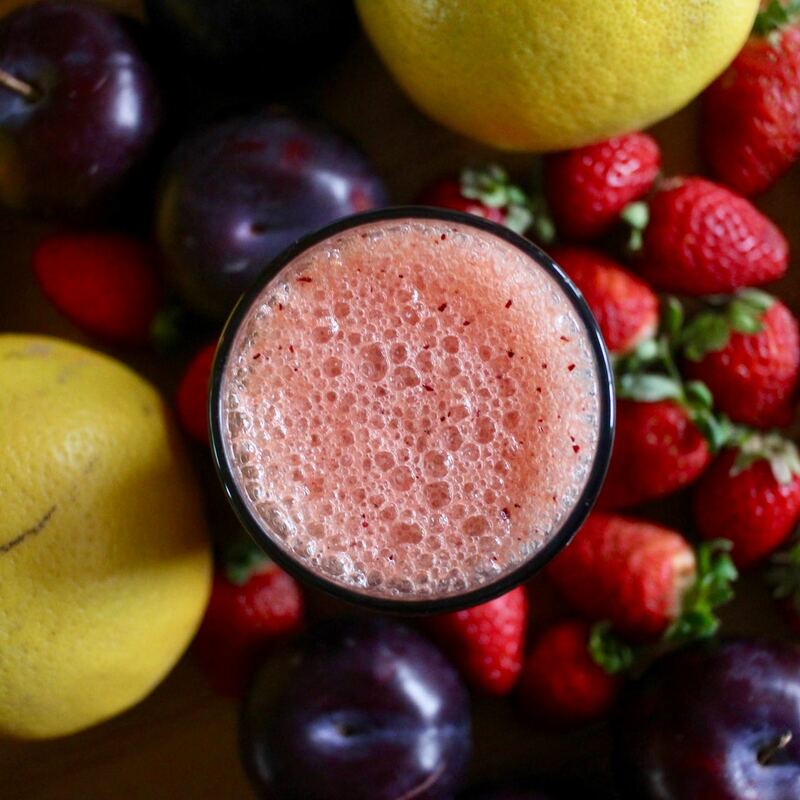 This juice is very good for these sort of lazy days too. The juice does not need an electric juicer but is made very easy with a high power blender. 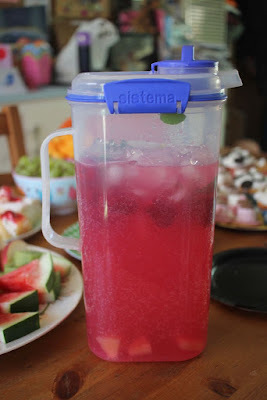 I think the ice helps keep it from getting too intense but you could always add still or fizzy water. I love it nice and cold with the ice. Sylvia likes to spoon the froth off the top before she drinks hers. And now that we have started to make hot cross buns, it means that if I am focusing on baking, I can quickly whip up the juice and get back to my buns. 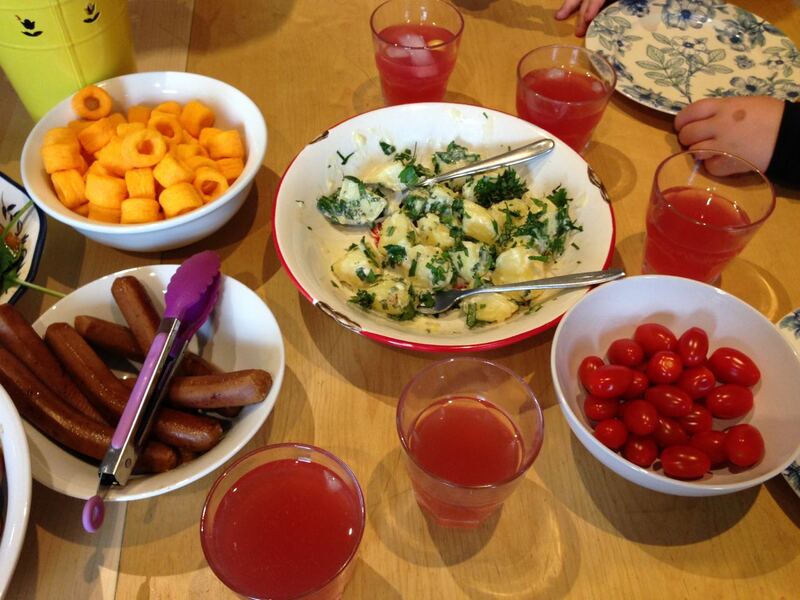 The juice also goes very well with a warm buttered hot cross bun. Blend (preferably in a high powered blender) until smooth. 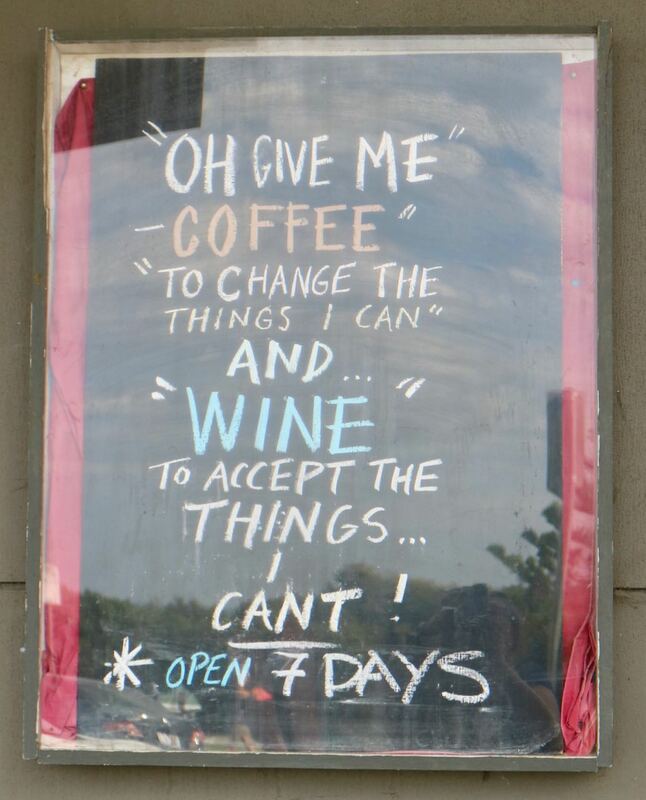 Drink immediately. Sylvia wanted punch at her party. So many punch recipes are alcoholic but we found one that was suitable for kids. 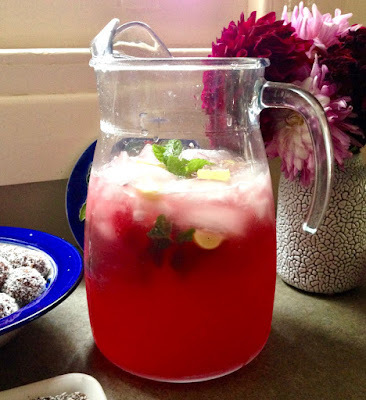 Of course punch is about a pretty drink with lots of ice and mint and fruit. We liked this one so much she had it at her party and then when we had a birthday lunch with my family. I only made a small amount at Sylvia's party as it was a small gathering and I didn't want lots of of leftover with fizzy drinks in it. (And I didn't even consider ice cream that was in the recipe we adapted because ice cream is something you put in a individual drink but not in one that will sit around with ice cream melting in it!) I think we might have made up more than one lot. Sylvia insisted on red lemonade. I would have preferred ginger beer in the mix instead. It is interesting in the above picture that the raspberries float and the tinned pineapple sinks. We had all sorts of robust discussions about a cake to take to a birthday lunch in Geelong. 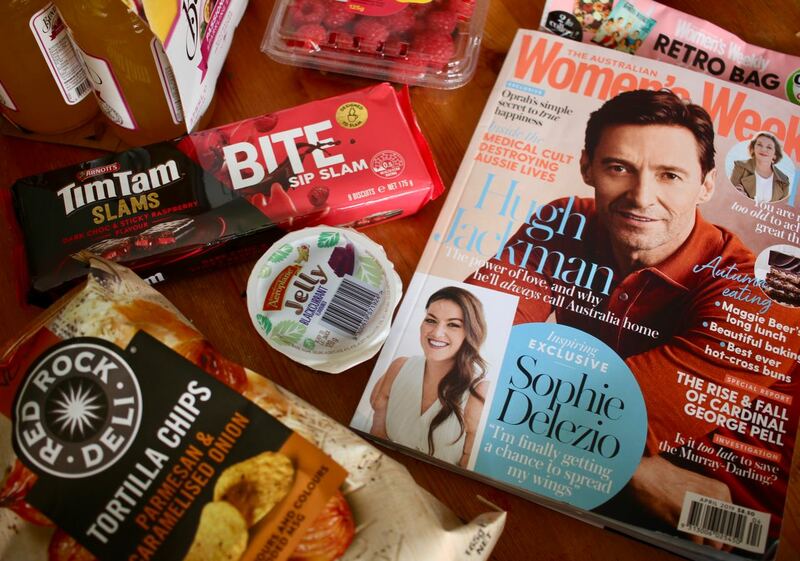 She really wanted the lamington 10 from the classic Australia Women's Weekly Birthday Cakes book. The logistics, esp with cream on top, got the better of me, esp when we had a leaking tap and decided maybe I could change the washer myself. My dad ended up coming to help and it ended up needing some mucking around and visits to Bunnings for washers and o rings. My energy did not extend to cake! 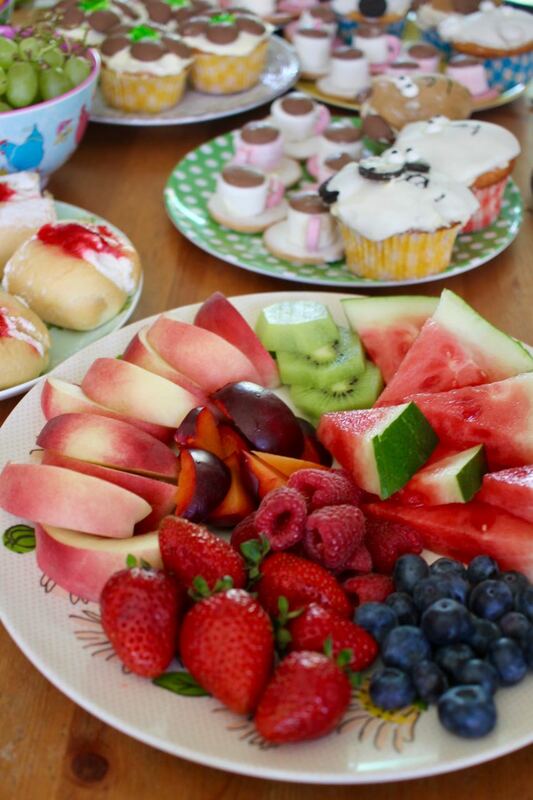 Instead we focused on familiar food. My mum did a bbq so Sylvia made her favourite potato salad. I made a batch of grubs for dessert. 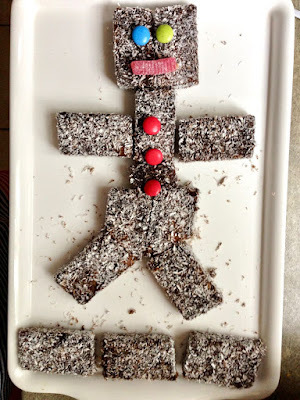 There was cheezels and pav and Sylvia bought some lamingtons from the supermarket to make a lamington man. And everyone enjoyed the punch. I finished off changing the washers after the lunch. At first it seemed to work and I was very proud of myself. Then the shower taps began to leak badly again. We turned off the water except when we needed a shower or to do dishes and survived on jugs and buckets of water until the plumber came after the end of the weekend. But kudos to my dad for his help and for then helping with fixing the flywire on our front door after our cat scratched it off. He has a great knack from doing stuff around the house. 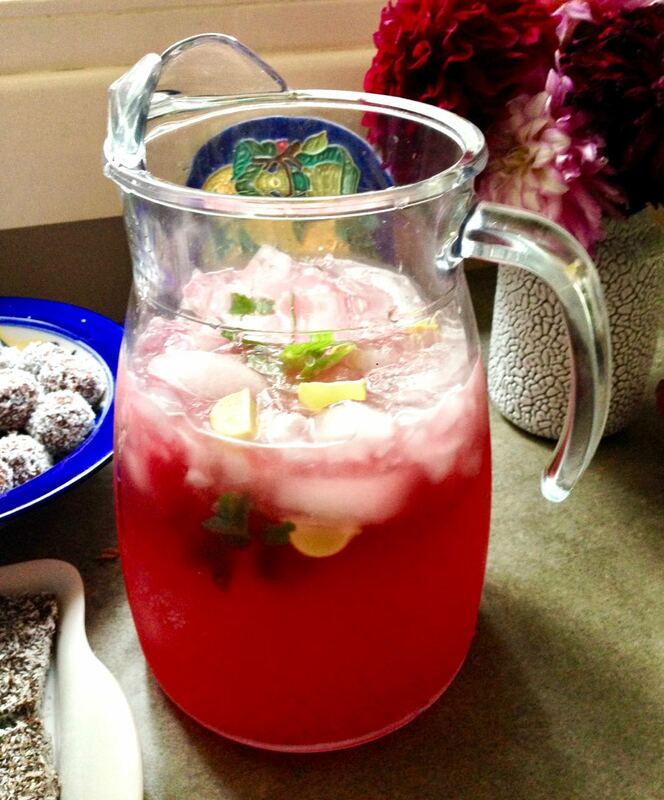 Mix all punch ingredients together in a jug not long before ready to serve. Serve with raspberries, mint leaves, pineapple and ice cubes. As always, there were many discussions on the theme of Sylvia's birthday this year. She insisted on a We Bare Bears theme. It is not a tv show with which I am very familiar. Sylvia had lots of ideas and turning 10 years old meant she was able to be involved in a lot of organisation. 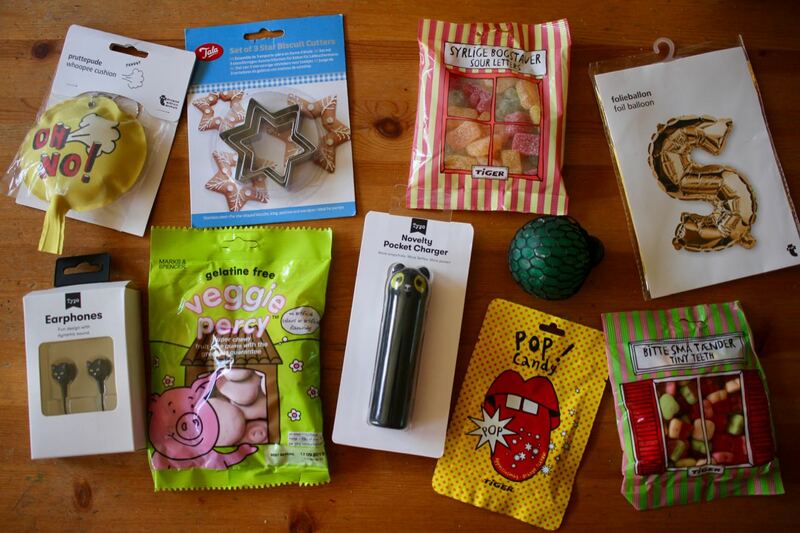 Here is a selection of her birthday presents on her birthday. She is lucky to have some generous overseas family as well as friends and family more close by. For her party she invited 3 friends and one couldn't come so it was a cosy group. Initially they were going to come after lunch but then it was easier for one parent to drop her kid before and so we asked the other to come earlier as well. Which meant it was a 4 hour party rather than a 2 hour party. But at this age, the girls are able to entertain themselves so it was fine. 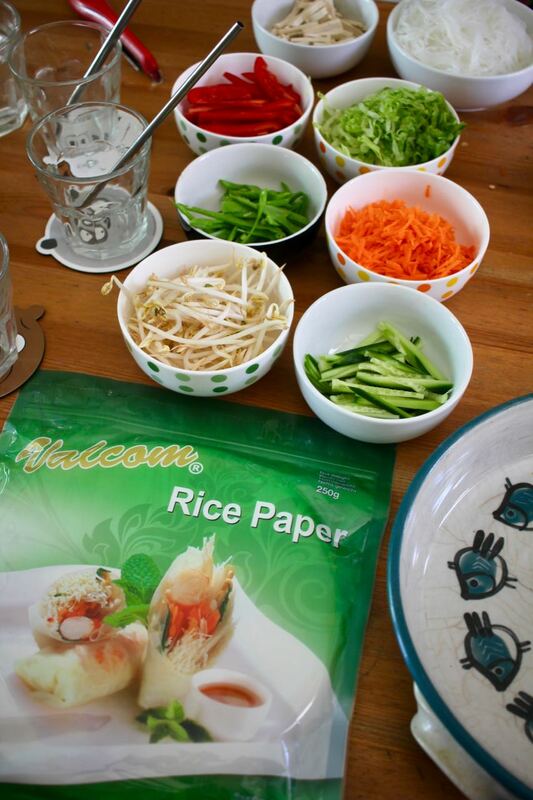 We decided to make rice paper rolls for lunch. Sylvia had been keen to make them and it was a fun group activity. I made them like these rice paper rolls. It had been so long since I had made them that it took quite a few til I hit my stride. It was a messy and fun thing to do. My mum came to help which made the party much easier. Sylvia had taken charge of a lot of the activities. The kids did a What We Bare Bear Are You quiz (based on one at the Cartoon Network). It was a good ice breaker because they all had their personalities to discuss. Sylvia and one friend were the solitary, stoic and clever Ice Bear whereas the third kid was the easy going outgoing Grizz. Sylvia had wanted a cake decoration party. They started by making some tick tock teacups. We had heaps of buttercream icing so it was useful here. 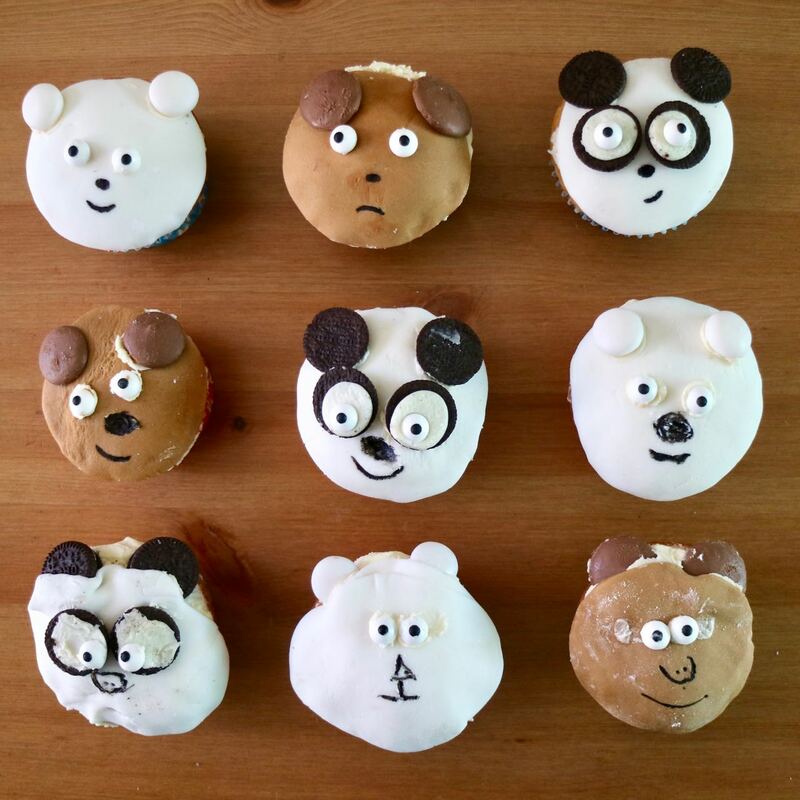 The main event was the We Bare Bear cupcakes. 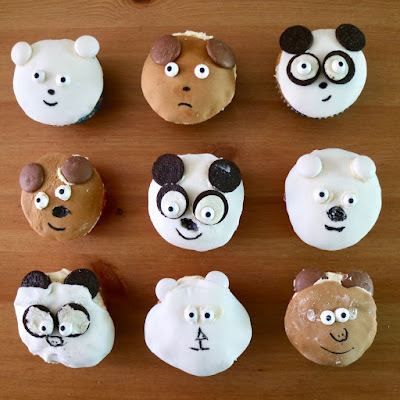 Sylvia wanted each kid to decorate three cupcakes with fondant to represent each of the bears. As we don't do a lot of fondant decoration, we had a practice a week or two beforehand. 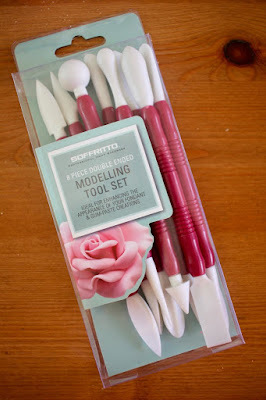 This proved very useful in getting out head around some basics of fondant and how the cupcakes might look with what we had. I looked into Sylvia doing a cupcake decoration course but they were so pricey that we decided to do it at home which was pretty easy. After all, part of these courses are just having the chance to experiment. It was very interesting watching the three girls at work and their different approaches. I took very few pictures of the cupcakes because I was too busy advising the girls and then getting the afternoon tea ready. I had to remind the girls to use icing sugar so the fondant did not stick. We purchased some candy eyes which made the cupcakes look pretty cool. I had organised a table for the girls to decorate outside but it was warm so they decorated inside and that was fine. They aren't as messy now they are a bit older. I didn't have enough mini rolling pins like the pink one above so we ended up using a cylindrical wooden block so everyone had one. Once the decorations were finished, the girls went outside to do pin the tail on the We Bare Bear with E helping out. I realised the We Bare Bear cupcakes were too cute for candles so I decorated a few leftover cupcakes with chocolate melts and sprinkles quickly. My mum and I tidied up and put out fruit and cakes. 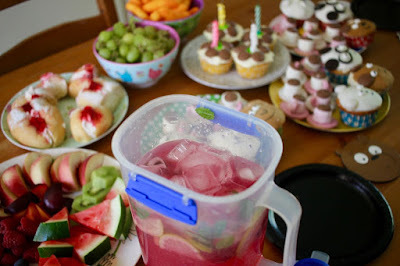 There was heaps of food, singing, candles, a birthday punch (that I will write about another time) and colourful cardboard boxes so Sylvia's guests could take their creations home. Sylvia and her friends had great fun. For me it was pretty easy to prepare. I just tidied the house, made some cupcakes and saved my energy for helping out while the kids made most of the food. 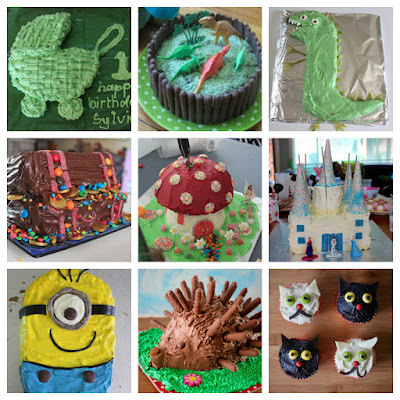 To celebrate 10 years of Sylvia's birthdays, I have made a collage of her previous 9 birthday party cakes. I wonder what sort of cakes and celebrations the next 10 years will bring! 1. Firstly check you have a round cutter that will cut a circle about the size of the cupcake top as you will want to cover it. If you don't have a scone cutter or cookie cutter, you can use a well dusted (with icing sugar) glass or cup of the right size. 2. Take a small blob of white fondant and keep the rest of fondant in an airtight container. 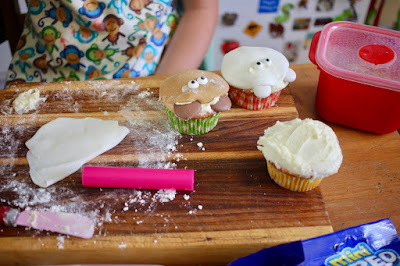 Roll out the blob on a wooden chopping board with a rolling pin, keeping both board and rolling pin lightly dusted with flour. The fondant can stick: to avoid this, pick it up and turn over regularly while rolling out. The fondant should be about 2-3mm thick. While it is important to use the icing sugar to stop the fondant sticking, it is also better not to have lots of icing over the fondant, esp the brown one. 3. 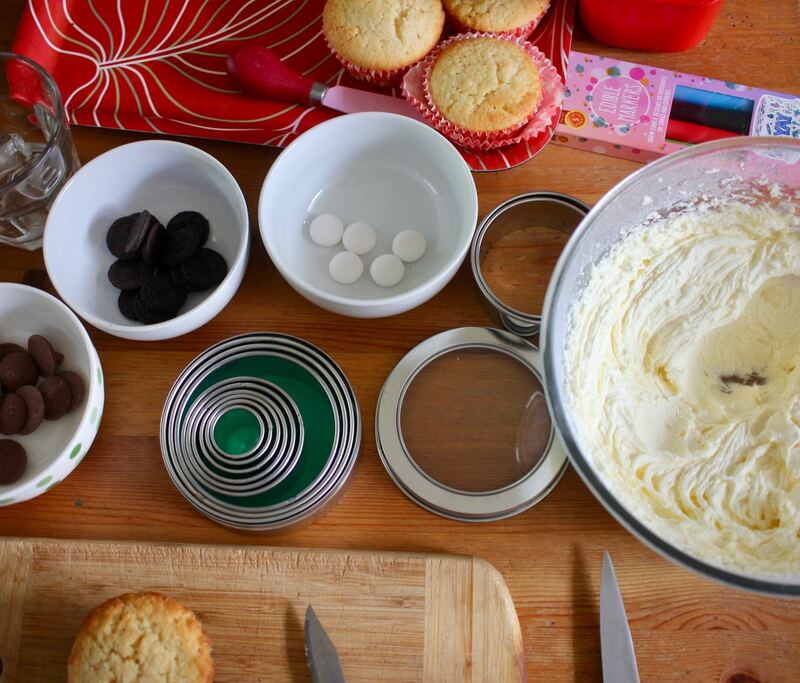 Spread buttercream in a thin layer on a cupcake. If required, neaten buttercream around the edges so it isn't ragged. Cut a circle of fondant and place over the buttercream on the cupcake. Smooth it down with your hands. 4. To make Ice Bear: Use buttercream to stick on white mentos as ears. They should be sticking out of the circle of the face slightly. 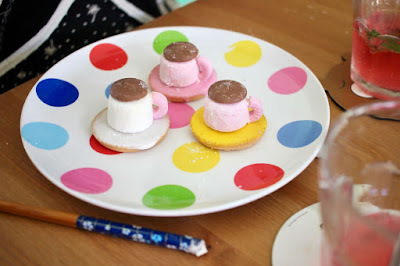 Use buttercream to stick on candy eyes almost halfway down the circle and have them fairly close together (about 0.5cm apart) With a black edible marker draw on a nose about the shape but smaller than a jelly bean and a wry smile (or do your own style of nose and mouth). 5. To make Panda: Repeat steps 2 and 3. As for step 4 but use half a mini oreo with no icing for ears and half a mini oreo with icing for eyes. 6. To make Grizz. Using brown rather than white icing, repeat steps 2 and 3. As for step 4 but use milk chocolate melts for ears. Beat butter 3-5 minutes until pale and creamy. Gradually add icing sugar until it is absorbed by butter. 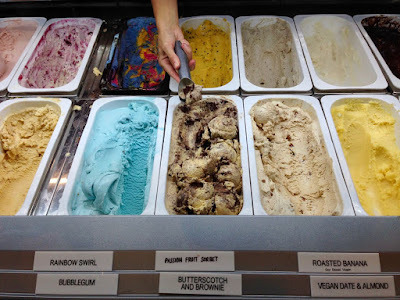 If it is creamy, you can stop here. However mine was little pellets of sweet butter and needed me to beat in a drizzle of milk at a time until it just turned creamy but still was able to hold its shape. April bring lots of holidays this year. 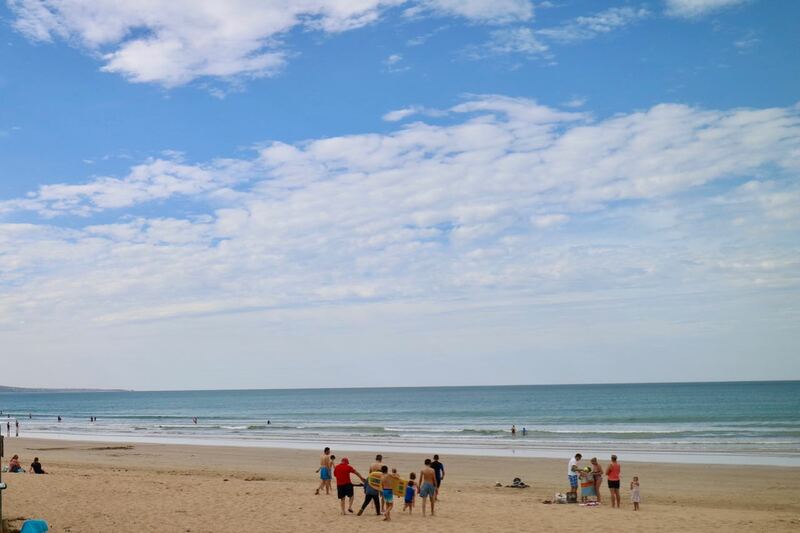 School holidays, Easter Holidays and the ANZAC Day holiday. And I am ready for them after finishing last month with a bout of sickness. 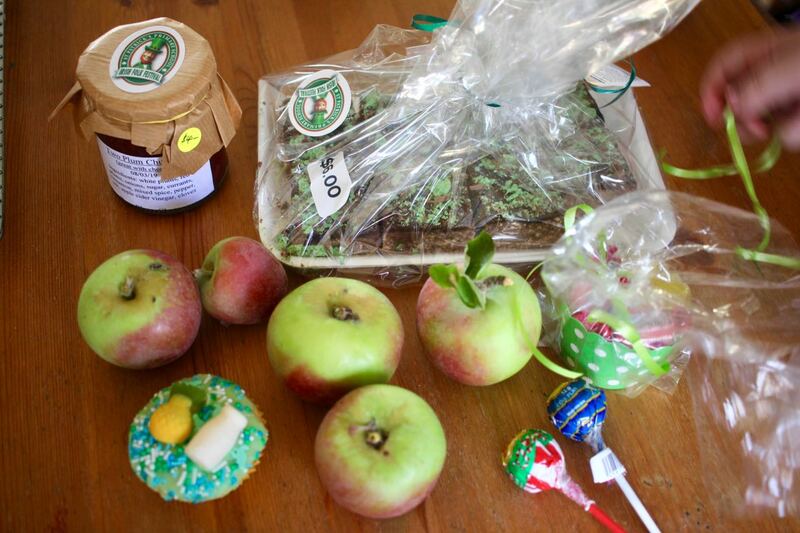 However March was full of fun with St Pat's greens, of change of the season and fresh apples. But let's start above with some cheery pop-art labels on tins of my favourite Annalisa diced tomatoes. It has been busy with work going crazy and not much energy at home so I haven't been baking much. 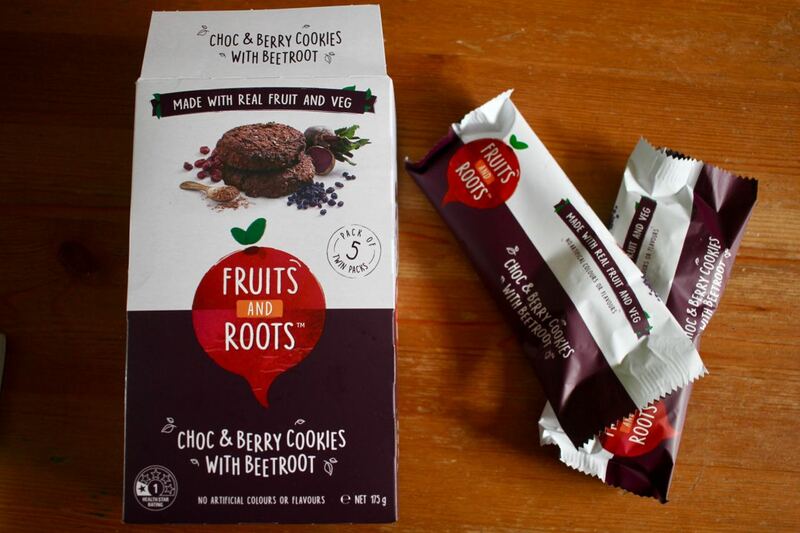 These Fruits and Roots Choc and Berry Cookies with Beetroot have been a great little snack at work. Actually my boss came by the other day and looked at them with suspicion, saying that his daughter had a way of finding interesting snacks. Wrapping the cookies in pairs seems excessive packaging but it is convenient. 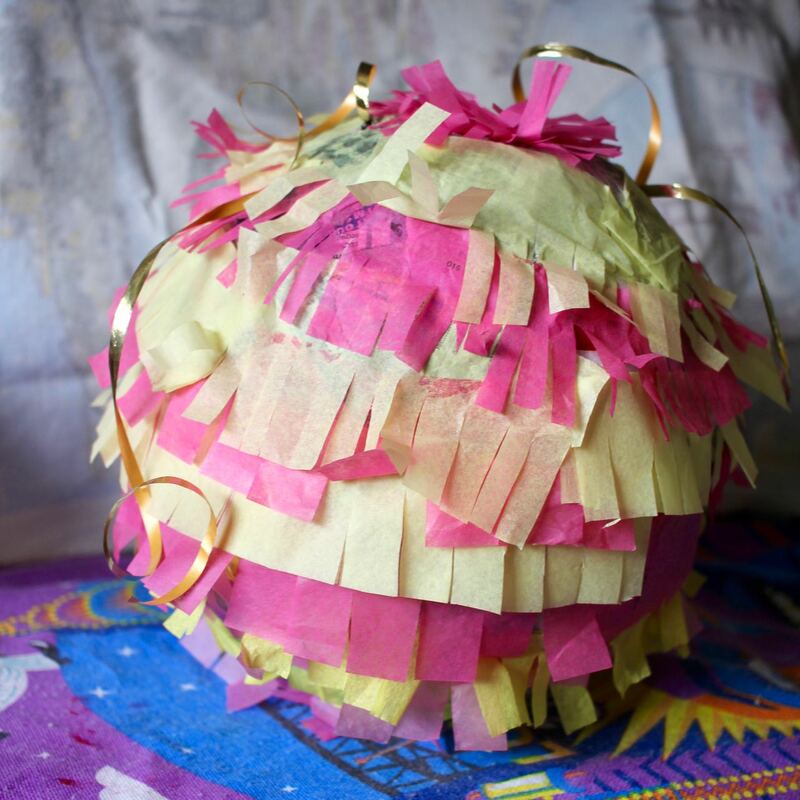 We saw there was a free make-an-easter-pinata course for kids at the local library. So Sylvia and and friend went along and brought home a pretty pinata each. I have insisted that we wait until Easter to crack it open with her cousins. 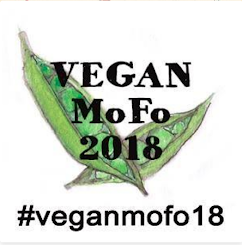 It seems a long time away but I am sure it will be here before we know it. I have been pleased that Sylvia has been trying a few new foods lately. She is particularly smitten with cheese. Haloumi is one of her new lives. She has even been known to fry it up herself. 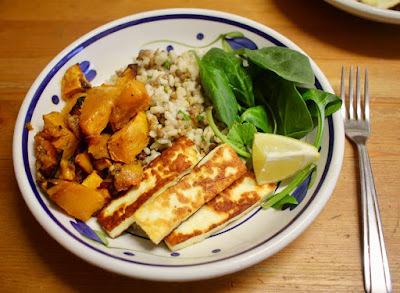 (The plate of haloumi, spinach, roast pumpkin and rice and lentils above is my dinner. not hers) She has also tried my mum's spinach and cheese puff pastry pie and is talking about trying other soft cheeses. 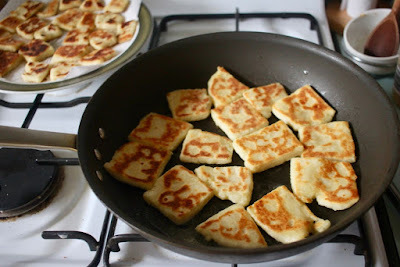 During Harmony Week this year, Sylvia managed to be sick on the day, they were taught a cultural dance, forgot to wear cultural dress the next day but we did some tattie scones for the lunch where they had to take some traditional food. It was a rushed morning but she was pretty happy with her lunch that day. 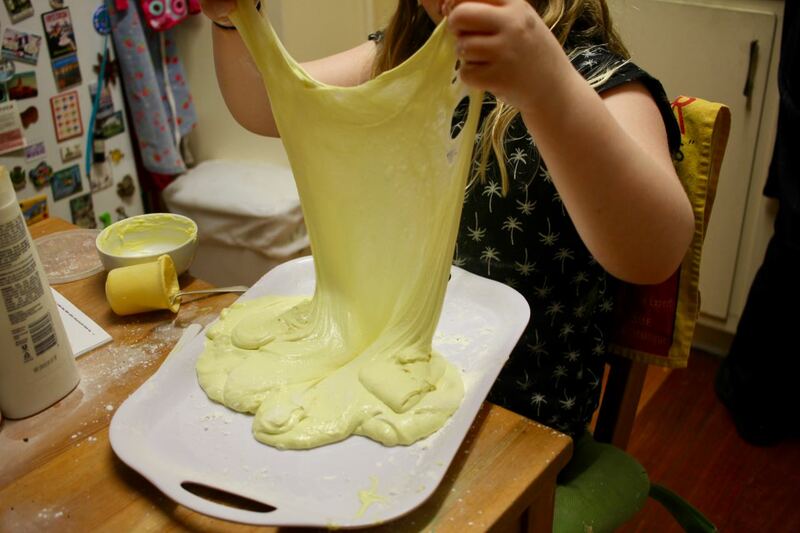 We've had a lot of slime in the house lately. Sylvia has become a bit of an expert at slime using glue, activator and shaving cream. I borrowed a book from the library called "101 kids activities that are the ooey, gooey-est ever!" 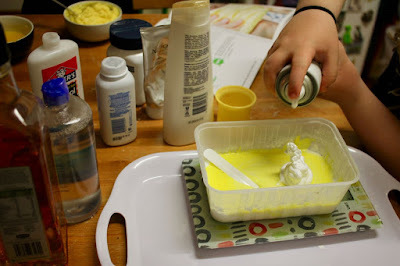 I bought her ingredients for a complicated butter slime (yes there are many types of slime): saline contact liquid, baby powder, hand lotion, oil, shampoo, bicarb soda, shaving cream and of course butter. The recipe in the book didn't work as hoped and Sylvia had to doctor it to get it coming up in a curtain. The next day she tried again with some soft clay from Daiso and activator and had her most wonderful butter slime. Watching her make the more complex butter slime from the book but it is fun to see how much fun she has with her butter slime made from clay. We have had a bit of fun with fondant lately. So when a local kitchenware shop had a huge sale I was tempted by some fondant implements. I am not sure how much I will use them. Perhaps some time we will have a go at more fondant decorating as we still have leftovers of the huge amount we bought for Sylvia's birthday. Coles supermarkets has done it again: given away little plastic toys in plastic packages to set young hearts aflutter. 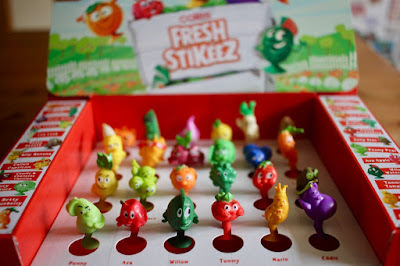 These Stikeez have not been as huge as the Little Shop collectables last year but Sylvia has enjoyed collecting and swapping. I think Coles has been appealing to parents by focusing on fruit and veg this time. Interestingly Woolworths yet again managed to have some giveaways that are a lot less plastic focused than Coles but not quite as popular. 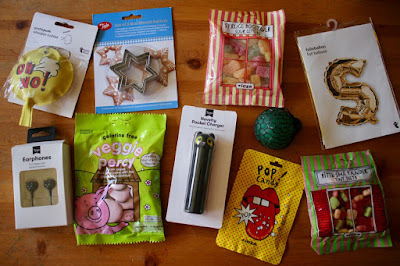 After I went to stay at my parents and visit St Patricks Day Irish Folk Festival, I bought home goodies from the fete and apples from my mum's tree. The apples were superb. And the plum chutney and peppermint slice did very well for lunches. 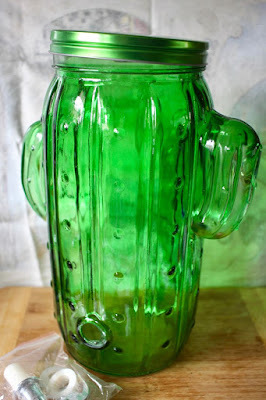 I was very excited at the fete to find this cactus drink dispenser. We had bought the same one early in Summer and then found that the hole for the tap broke easily if someone (no names) did not read the instructions. Here was our second chance to get it right. I can't say we have used it yet apart from to test it but I think I will put it away for next summer. Actually I felt like I needed a bit of comfort food this morning when I got to work and discovered that I was the only person left of my team of 4 people, with everyone else either ended their contract or on extended leave. Luckily I have a good group of people around me who are not in my team but are very supportive. Though I did think it ironic I baked a cake from morning tea at work this morning and then bought packets of biscuits for home. Life is a bit odd like that lately. Hopefully it will calm down over April.